We're just under a month away from the Summer Farmhouse Retreat and I'm so excited to start nailing down some details. As part of the retreat signup process, I asked the crafters to complete a quick survey to give me some ideas for sewing workshops that might be suitable. I was surprised by how many people were interesting in learning how to quilt! It will be a dream come true to dedicate an entire weekend event to quilting, but having a workshop start us off on the process is going to be such a great start! And this could not come at a better time. While Magda is pretty much done her baby quilt, I have yet to even decide on a pattern for my own baby-to-come. Baby (gender inconclusive, I'm assuming divergent) is due at the end of August, and I think it's safe to say that I shouldn't assume I have time after August to work on the quilt. This workshop will hopefully help me out with picking a pattern. I'm smitten with three patterns at the moment. First, is the Pow Wow quilt: a great chevron pattern popping up all over the interwebs and is available from the Cluck Cluck Sew website. There are lots of fabric scrap possibilities and is hopefully quick and simple to sew together. Second, I fell in love with Karyn's feather quilt top. The beautiful feathers are a free (FREE!) pattern available from the fantastic Anna Maria Horner. Clearly not as simple a quilt to sew, but boy is it ever gorgeous. 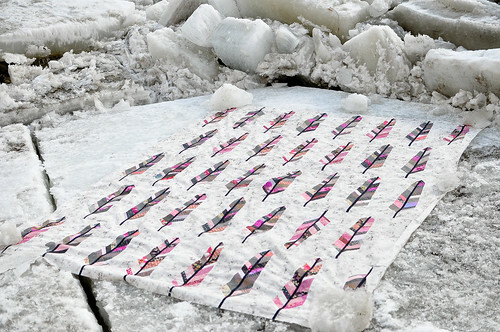 Elizabeth Hartman's Fancy Fox quilt from Oh, Fransson! And third, I discovered that Elizabeth Hartman just came out with a new fox pattern. Yesterday she revealed a stunning patchwork fox that I think would be perfect for a gender neutral quilt. This pattern isn't available until mid-May, but judging from her other patterns it will be moderately priced and filled fantastic instructions on cutting and piecing all the fox parts together. So back to the farmhouse. The Saturday optional sewing workshop will be these three quilt blocks. The Pow Wow chevron will be a great beginner block to learn the basics of piecing; the Fancy Fox and the Feather Bed Quilt will be intermediate blocks for those seeking a bit of a challenge. We will learn the techniques of piecing fabric, how to do a mini quilt sandwich, different techniques to quilt the layers together, and then we'll throw it together in the form of a pillowcase! Stuff with a $5 Ikea pillowform, and tada!